Visit this fascinating piece of pioneer history near the Willochra Creek. 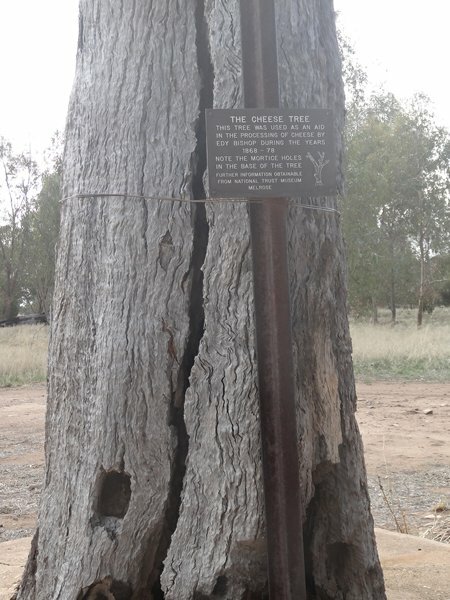 The Cheese Tree was created in the 1860s by an industrious woman named Edy Bishop who moved to the area with her husband George. George was given milk by a station owner he worked for and Edy used it to process cheese to sell. When the cheese was ready to be pressed she placed the end of long rails in the mortise holes cut in the tree and hung weights on the other end of the rails. The cheese, in suitable containers was placed underneath and weights gently but persistently pressed the cheeses until they were mature enough for sale. The cheeses were then packed and sent to Clare to be sold. The Bishop family moved from their home on the Willochra Creek in 1878 The Bishop family moved from their home on the Willochra Creek in 1878 to take up nearby land in the Melrose district, which they named Denham, and to this day this land is still owned by the Bishop family. This wonderful piece of history remains as a memorial to the pioneers innovation. This pleasant 22 km cycle and walking trail was built in 1884 but not completed to Wilmington until 20 July, 1915. The last train to use the line carried grain from Wilmington in 1988. After that it was turned into a cycle track which heads north from Melrose through Terka, past Mount Remarkable, and eventually arrives in Wilmington. There is a map and a downloadable brochure available here. The bike trail is sign posted as Intermediate (IMBA Easy- Green). 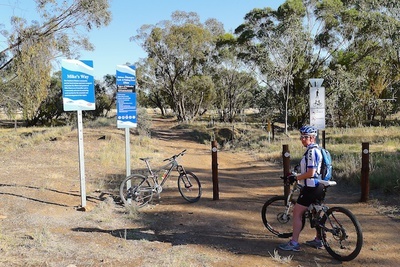 The trail is basically flat to gently undulating with a few rough red gum creek crossings. The riding itself is not technically challenging and suitable for beginners. If you are going to ride out and back you should have a moderate level of fitness as it is about a 50 km round trip. In the middle of the great 1860s drought, George Woodroffe Goyder, Surveyor General, was sent out to ‘lay down as nearly as practicable, the line of demarcation between the portion of the state where rainfall has extended and where the drought prevails’ (quoted in Mincham 1983:111). Goyder used the vegetation zones as guides for rainfall zones. Saltbush was the main marker. The line Goyder drew is a rule of thumb for land use. Land south of the line is generally suitable for growing crops. Land above the line is generally suitable for grazing – not crops. The line which passes through this area became an important factor in settlement in this State. 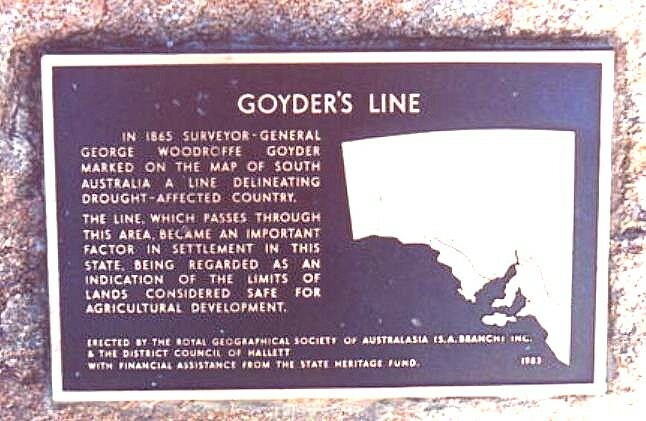 With a run of excellent seasons in the early 1870’s and a scarcity of agricultural land available, locals agitated for closer settlement north of Goyder’s Line by abolishing the deferred line and throwing all the country open for selection. The Government yielded to public pressure and abandoned the line and by September 1875 the Hundred of Willochra was opened for selection. Other hundreds in the area were taken up in quick succession and by 1877 much of the land was under crop. Melrose War Memorial and the Mount Remarkable Copper Mine Located on Joe’s Road on the hill (Mount Remarkable) overlooking the town the Melrose War Monument was constructed to commemorate those killed in action during World War I. It was paid for by public subscription. The World War II gates in the main street of Melrose adjacent to the Memorial Gardens were erected because it was considered that elderly citizens would have difficulty accessing the monument on the hill. 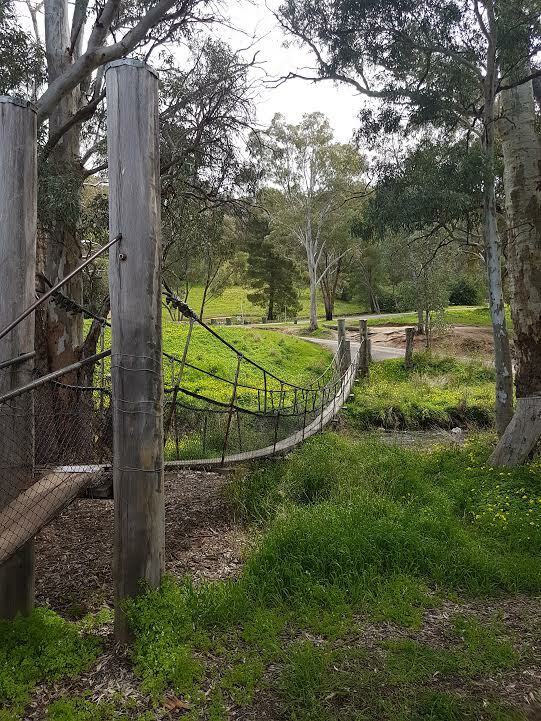 From the monument you can walk on the Melrose Nature Hike to Mount Remarkable Copper Mine which is located 3.5 km south of the monument. Beyond the mine site there is a walk to Bald Hill Lookout. The sign to the mines notes: “Mining operations commenced in 1846”. The Melrose Mine, which is located along the Nature Walk, was first worked in 1848. No lode of any consequence was discovered in either mine. Wages were high and transporting the ore was costly. Both mines closed in 1851, with the dissolution of the Mount Remarkable Mining Company. The Melrose Mine was again worked in 1873, 1907 and 1916-1917. 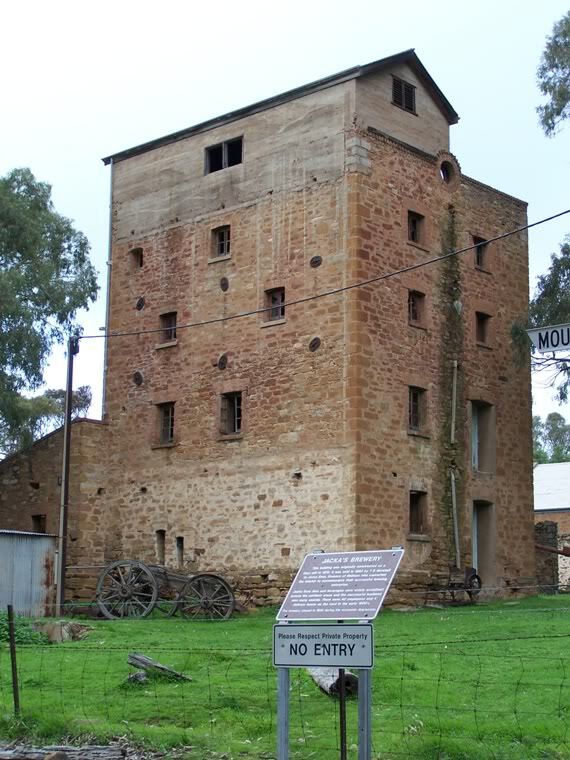 Although the early copper mines were financial failures, they did create interest in the Mount Remarkable district. When Melrose was eventually surveyed, it was in country which was already well known, and this undoubtedly helped to get the remote township off to a good start. The Bridle Track is a popular free four wheel drive track which commences approximately ten kilometers south-west of Melrose leading off the Survey road from Melrose. 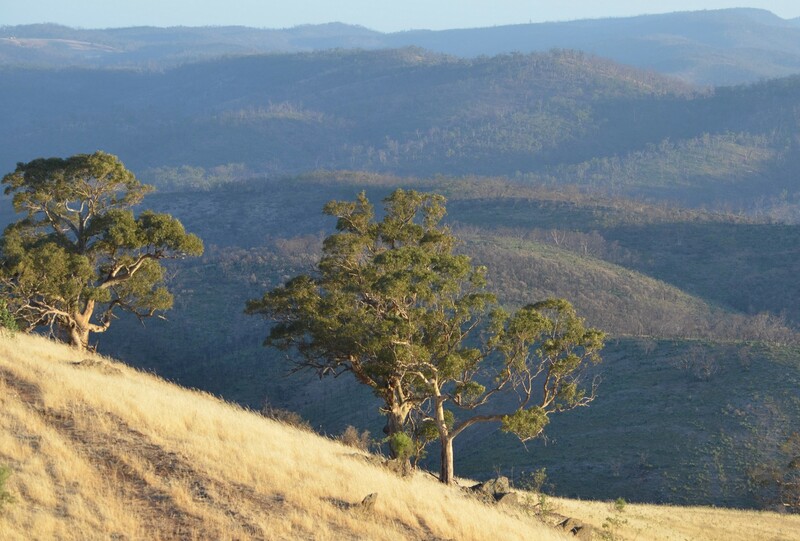 The track provides an opportunity for not only a great drive, but also some of the most sensational views in the Southern Flinders Ranges with some fantastic spots for lunch or to watch the sun set. This hotel replaced the original pug and pine inn built by one of the early police troopers at Melrose. The two storied building has lintels of red gum and timer shingles still visible in places. It has a quaint balcony and two single story wings that form a courtyard at the rear. Continuous Licence has been held since 1857 and the building is largely unchanged since 1860. It has catered for the famous and infamous, the rich and the poor, the successful and down-and-out for almost 150 years along with other hotels in Melrose. It is listed on the National Trust Register. The North Star Hotel is the oldest licensed hotel in the Flinders Ranges. It was first licensed in 1854 as a simple log house and later converted to a neat single storey building. In 1881 a portion of the old building was demolished and the present two-storey building was erected, with renovations and extensions made in 2004. The present building, which was built in 1865, replaced the original pug and pine building known as the Melrose Inn (1857). Licence was cancelled in 1877 and the building was converted to a General Store. Various enterprises have followed and a Bakery was established in 1921. Later on tea-rooms were added. It is now a private home. Originally built in 1878 as a flour mill for T.B. Marshall. Grain from the wheat growers on the Willochra Plain was milled here until the business depression of the 1890’s brought about its closure as a flour mill. J.H. Jacka transferred his brewing operations to this location in 1893 and the business flourished, producing quality products using the high quality Melrose spring water. As well as beer, Jacka’s Brewery produced cordials and aerated waters. The Brewery supplied many areas in the region, Specially constructed wagons carried heavy loads of wooden casks, drawn by teams of eight horses, wound through the gorges of the Flinders Ranges to Port Pirie and Port Augusta. With the extension of the railway to Broken Hill, beer was sent there. After World War I business began to decline for a number of reasons and the depression of the 1930s was the final blow. The brewery closed down in 1934. The Post Office and residence was built in 1866 and in the same year the telegraph line was put through Melrose as part of the linkage which connected Melrose and Port Augusta. The Post Office was closed in 2005 and now operates from the District Council building. This site was the fourth to be used for the purpose of education in Melrose. Earlier schools were run in two pug and pine cottages and one in the Institute. The SA Government built this school in 1879 at a cost of £1,490. It was designed to accommodate 80 children ( 107 children attended in the first year) and had a teacher’s residence attached, which is now used as the Melrose Kindergarten. The school grounds were part of the original Police Paddock, which once extended from the Institute Corner to the present northern outskirts of the town. The grounds have grown considerably since then with the transfer of the last of the Police Paddock in 1968 to form the school oval. Erected in 1862, this was the second Courthouse built on this site. It was the headquarters of the Far Northern Police Division which included 18 police stations until 1881 as well as being the Local Circuit Court. Constables patrolled 4 000 square miles of scattered communities and sheep stations on horseback and had to enforce a variety of laws relating to sheep stealing, handling of stray cattle, illegal gambling and ensuring the closing of hotels at 6 pm which caused resentment on hot summer nights and in the harvest season. Melrose ceased to operate as a Police Station in 1967. Today the buildings serve as the Melrose Courthouse Heritage Museum helping to tell the story of law and order in the north as well as the history of this unique township. The first Institute erected in 1873 was demolished and rebuilt in 1907 and extended in 1926. This was opened in 1885 and patients paid two guineas ($2.20) per week. The hospital was never completely successful “as Melrose’s pure mountain air made the place too healthy” and it closed in 1888. This is now a private home. One of several, this original pug and pine cottage was built in the late 1850’s and is a fine example of how these cottages have been adapted to provide adequate housing for families for almost 150 years. This is now privately owned. Built in 1865, it was one of three blacksmiths in the town and provided for the needs of the mounted police force as well as the wider community until 1914. It then operated as a carpenter’s shop for 30 years and later as a bed and breakfast and licensed coffee shop. It now runs as a Bed and Breakfast. The chambers of the District Council of Port Germein were erected in 1904 and various additions were made over the years. In 1980 when the Council was renamed Mount Remarkable major structural alterations occurred. This old cemetery which dates from 1853 was never consecrated ground but its location opposite the Police Station caused it to become the early burial ground for those who died in the vicinity of Mount Remarkable. The well tended gardens are a fitting memorial to those who were buried here. During the 1890’s a number of swing bridges were constructed along the Willochra Creek in the vicinity of Melrose. The bridges provided access from the Workingmen’s Blocks for farm labourers, brewery workers and school children during periods when the creek was in flood. This replica swing bridge was erected in 1990 to replace an original bridge that was badly damaged in the 1946 flood.